I thought this was a curious sight. 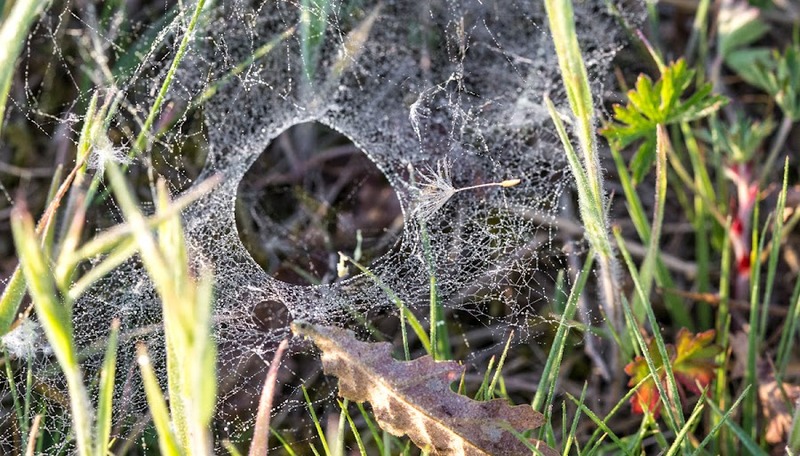 I've seen webs with funnels that guide prey down in toward the waiting spider, but this one has a huge hole in the middle. I don't know if it's by design or by accident, but it looked quite unusual to me. Can you see the dandelion seed caught on the web just to the right of the hole? Saturday was a nice day, weather wise. I went to the market in the morning for some asparagus (the price is coming down now) and strawberries. I made some short biscuits and we had strawberry shortcake and cream for dessert. I also picked up some coques (cockles) at the fish monger's so we can have linguini with white clam sauce for lunch today. The dogs and I spent a good part of the afternoon out in the sun, which was therapeutic after having got up at 5:30 to take Tasha out. Today we won't be so lucky. A storm system is expected to move through during the middle part of the day with a good amount of rain. April came in like a lamb, but it's going out like an iceberg. Yuck. Going for the morning walk with Callie is not pleasant. Coat, scarf, knit cap, gloves. And taking Tasha out to do her "business" at 6 a.m. is even less pleasant. It warms up some in the afternoon, making things a little more manageable. I tried to take a photo of the two dogs together outside yesterday, but Callie ran from the camera and Tasha just rolled around in the grass. Tasha plays with me in the living room. In this shot she's NOT biting my fingers. On Friday afternoon Callie and Tasha and I spent some good time playing outside. Callie is still trying to figure out who this new animal is, but Tasha just runs and jumps and rolls and has a good time. I left the two of them outside alone together for about fifteen minutes and they were good (I watched from a window). Then Tasha came bounding back in the house and collapsed for a nap. I like that. With better weather, we'll be able to spend more time outside and less time trying to play indoors. And, as a bonus, Tasha learned to climb the stairs in one day! She can go up, but she hasn't yet learned how to climb down. That'll come as she gets bigger. Here's Tasha on her downstairs bed, under the coffee table, with her toys. There's an old sock, a little rope, a red plastic donut, an old nylabone, and a gummi-bone (most are left over from Callie's puppy days). We had just fed her and taken her outside for a romp. Back in the house, she decided to take a nap. For which we are grateful. She's getting used to the collar now, too. Tasha taking a nap on her little bed. I promise (as I did ten years ago) that this will not become an all-dog blog. Still, this is what's occupying us right now; it's the current reality of our life in France. The weather is not cooperating, but we're making the best of it. It's really quite chilly outside, but they're predicting better temperatures next week. Always next week. I've been taking Callie and Tasha outside, mostly so that Tasha can do her business, but I'm noticing that the two of them are starting to play. Callie is cautious, but Tasha is bold. She charges Callie, but then when Callie asserts herself, Tasha rolls over on her back in submission. Callie is less apprehensive and starting to enjoy the play. It won't be long, I think, until they're fast friends. I'm keeping my fingers crossed. We're now in full puppyhood mode. Tasha goes from bouncing around the room to quietly napping about every fifteen minutes. I'm exaggerating, of course. 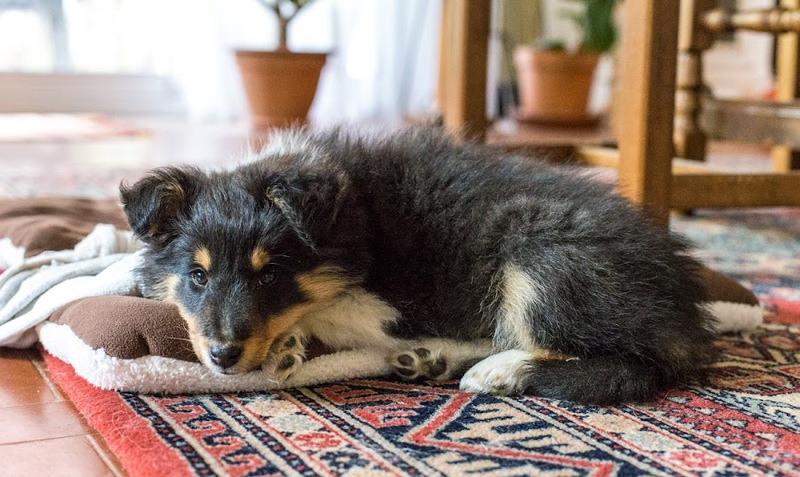 She is a tiny bundle of energy, but she wears herself out more quickly than Callie used to. She knows where her bed is. I'm planning on getting a second one so that she has a bed both upstairs and downstairs (right now we're moving her bed upstairs for night time and down for the day). She slept through the night again last night. And so did we. What wildflowers were these? I have no idea. Callie is doing fine. She's starting to set boundaries, slowly. Otherwise, she seems unfazed. We're trying to maintain her routine so she doesn't feel neglected (as if). Tasha and Bert have met several times and there's no friction. The cat is, for now, a lot bigger than the pup, but he doesn't mind her. And Tasha is curious about the cat, but hasn't made any aggressive moves toward him. After feeding, and whenever Tasha starts nosing around the room sniffing the floor, I take her outside for "poopies." She does pretty well. So far we've had a couple of little puddles on the floor, but no poops inside the house. She gets lots of praise when she does it outside. 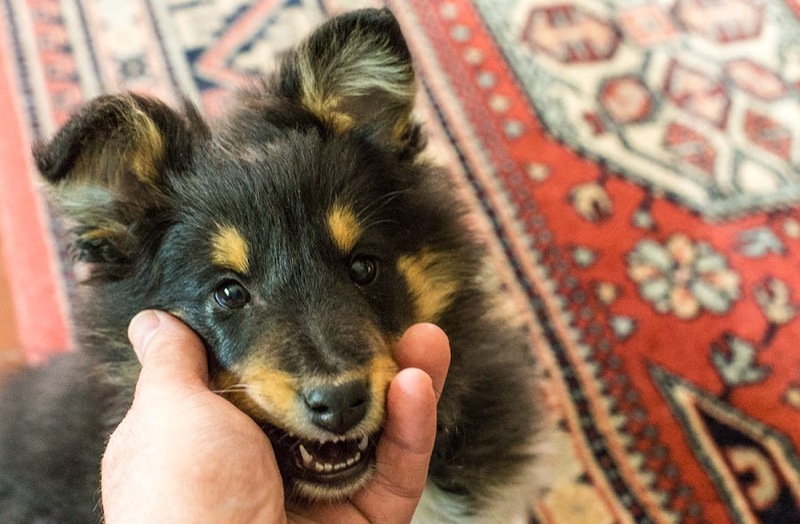 And that's our Puppy Update for the day! Wow! All of a sudden, she's here. We arrived at the breeder's a little early, anxious dads that we are. We saw all the dogs, and Tasha, of course. She took to us both right away with kisses and playfulness. Then we sat down and signed papers, and the breeder gave us a bunch of information about the dog, grooming, health care, shots, etc. She also gave us a small sack of puppy chow and a little bowl. Most of the time Tasha was on the table, sniffing and licking our fingers and letting us pet her. Then it was time to head off. She's such a tiny little thing, but it's hard to visualize until you see her next to Callie. That photo will come soon enough, I'm sure. Tasha was perfect in the car. She sat in Ken's lap the whole way, and slept most of the time. Once at home, she met Callie. It went smoothly; a little awkward, but no aggression. After a while we separated the dogs so Tasha could have some kibble. She was mighty hungry. Next, it was our turn to eat lunch. 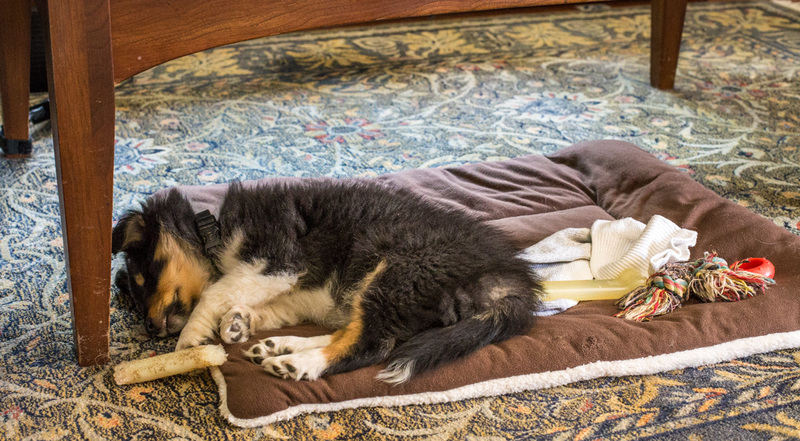 Callie jumped up on her bed in the other room and Tasha curled up on her new bed next to the dining room table. Naps ensued. It was amazing. We still have the afternoon and evening to get through as I type this (Tuesday afternoon). I took the dogs out for a bathroom break and I think Tasha peed, but so far nothing more. And later, it will be our first overnight. But, so far, so good! MORNING UPDATE: Tasha slept on her little bed all night, once Callie got up onto her own sleeping spot. Big sister is setting the example. And, she pooped outdoors this morning! Good dog(s)! 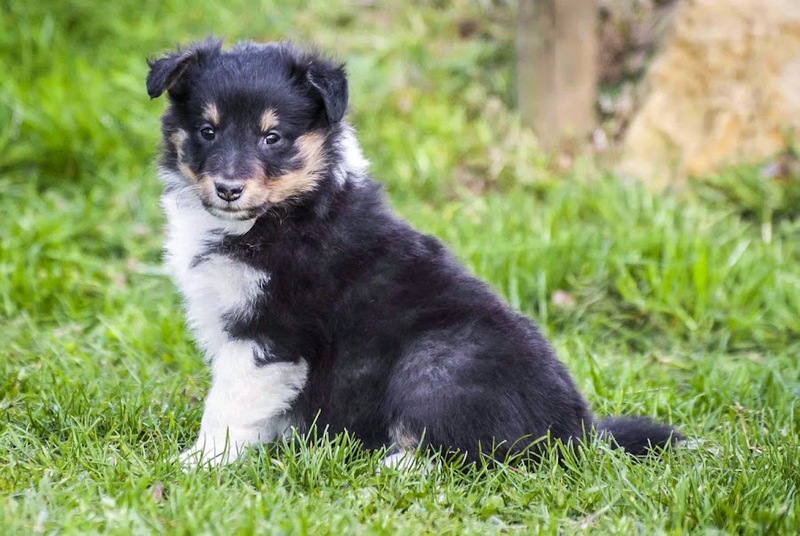 This morning we pick up Tasha, our new Shetland pup, and bring her home. 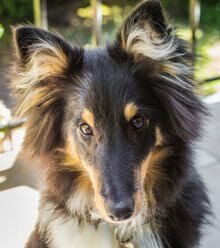 We're not sure what to expect with Callie, but we've been given some advice from our vet and some friends. I'm hopeful that our mild anxiety will have been for nothing, and that the two dogs will work out their relationship smoothly. I just wish today's predicted rain would fizzle out. There has been an uptick in activity in the vineyards. I don't know what they're doing out there, but I've seen workers coming and going, walking the rows, and tractors here and there. There's still quite a lot of green leaves sprouting in spite of the freeze damage, but I don't know what that means, especially for vines on which the first grape flower blossoms froze. Will there be more? I can only wait and watch. So, on Friday I made asparagus spears wrapped in ham and puff pastry for lunch. It worked out pretty well, if I do say so myself. I had peeled and steamed the white asparagus a day or two before. I wrapped three or four spears inside a slice of ham, but not before adding some grated Swiss-style cheese. I had four of these "rolls." 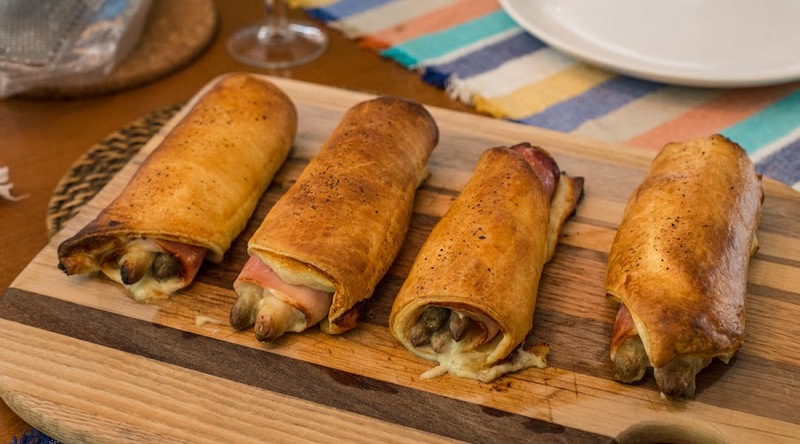 Then, I cut a store-bought puff pastry crust into four pieces and wrapped each one around a ham and asparagus roll. Into a hot oven they went for about fifteen to twenty minutes. Melted cheese is oozing out of my "spears in a blanket." The result was delicious, if not beautiful. Next time I will try to make the pastry a little less boring looking by adding some kind of pattern with a knife, or even by using pastry strips rather than a uniform sheet. It won't change the taste, but it might look a little more appetizing. The recipe is just a riff off the asparagus and ham tart I often make this time of year, but without the egg custard. I got that recipe from a television cooking show several years ago. 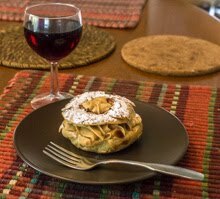 The original recipe made individual appetizer-sized tarts and used jambon de Bayonne (a kind of prosciutto-style cured ham). I morphed that into a larger tart with standard cooked ham in place of the cured stuff. I'm looking forward to spending summer days out on the deck. We've already had many nice days and I've taken advantage of them to spend an hour or so sitting out there. Bertie likes to come up and sit in my lap on those days. The deck tiles are clean and we're ready for summer! We're gearing up for the new puppy's arrival on Tuesday. Well, she doesn't "arrive." We have to go and get her. It will be interesting. So far, the weather is not predicted to be great. Grilled. Fried. Or, in this case, frozen to a crisp. Thursday's frost and freeze was a lot more serious than I first thought. In our area the vineyard damage is pretty extensive. With my untrained eye, I can see that a lot of new leaves and tiny flower buds have been frozen. 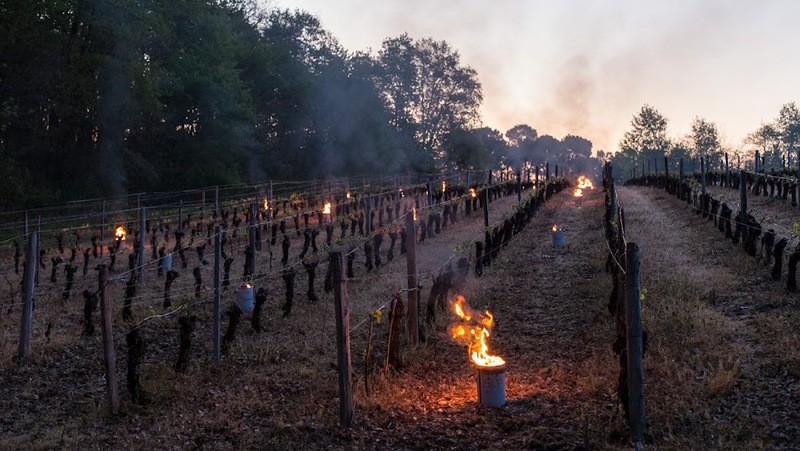 I think that the growers are still assessing the damage, but the local newspaper mentioned that many of the vineyards in the towns around us were affected. Just outside our back gate: new vine growth damaged by frost. The only damage I saw on our own property is on the fig tree. All the leaves froze. I'm hopeful that new leaves will sprout, but we'll have to wait and see what happens. The apple blossoms took some damage, too. Again, we'll have to wait to see how much fruit forms. 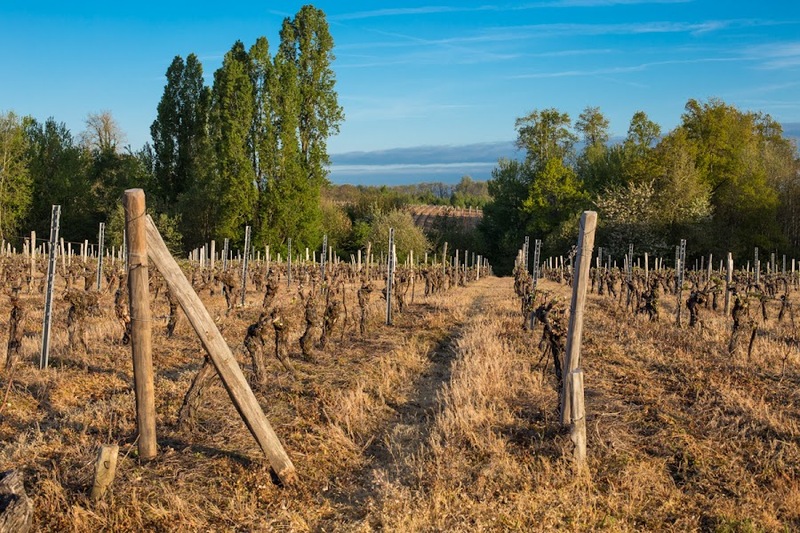 Unlike the grape growers, we don't rely on a good crop for our livelihood. A branch of our fig tree. 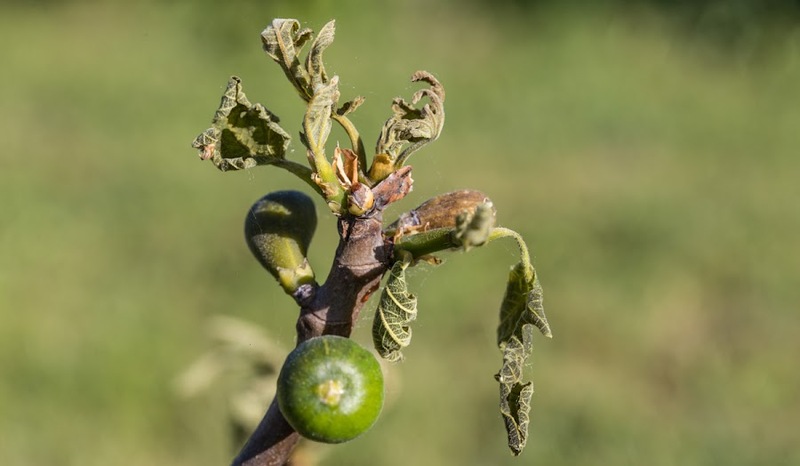 The once broad and bright green leaves have been shriveled by frost. We're in the height of asparagus season, and white asparagus is a crop that's a specialty of our region. For the last ten years or so, we've been getting our asparagus from one particular grower at the Saint-Aignan Saturday market. He also grows and sells strawberries and makes honey. I get the impression talking to him that he's basically retired, but continues to work the market on behalf of his son, who now runs the business. 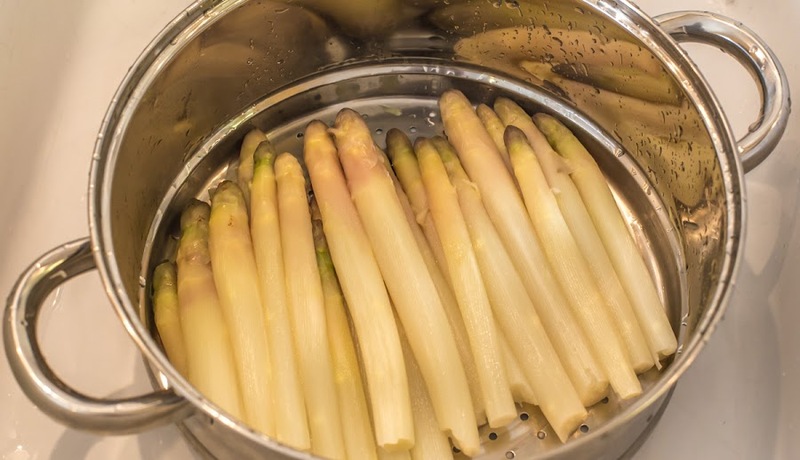 Freshly steamed violet asparagus. Steaming turns much of the violet part green, but the rest stays white. White asparagus is the same plant as green asparagus. The difference is that the spears are continuously covered in dirt as they grow so that they don't get any sunlight. That keeps them from turning green. And white spears need to be peeled before cooking. Often, the spears' tips are allowed a little light to turn them slightly purple, resulting in what's called les violettes, or "violet" asparagus. I bought a kilo of violet spears on Saturday and steamed them. We ate half of them with some smoked trout and a lemon-caper dressing on Wednesday. Today, I'm going to try something new: I'll wrap a few pre-cooked spears in a slice of ham, then wrap that bundle into puff pastry and bake it. I'll let you know how it turns out. A frost/light freeze was predicted for this morning. 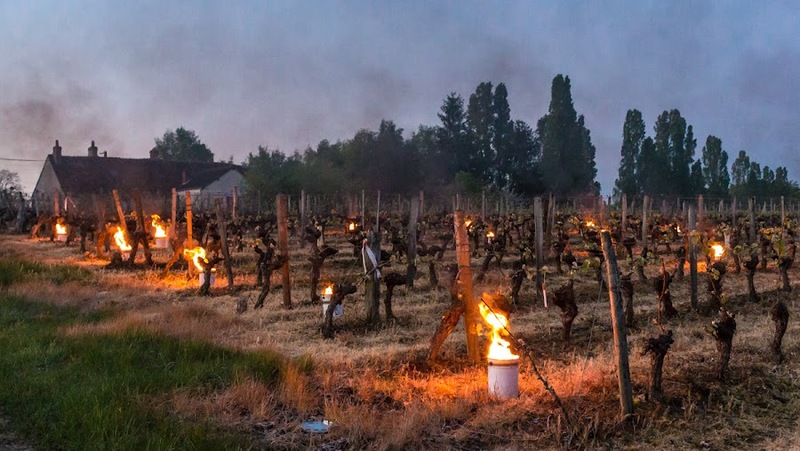 As we woke up, Ken noticed flames out in the vineyard. He quickly realized that the flames were from smudge pots. He saw the grower working out there last evening, but he wasn't very close and didn't see exactly what he was doing. 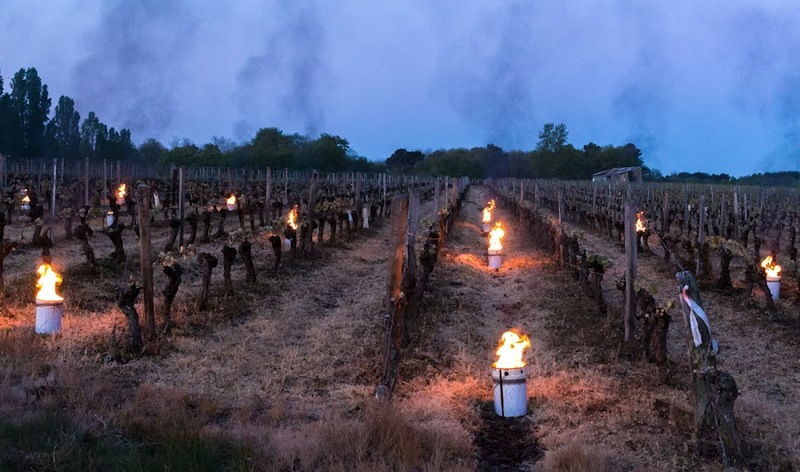 I think this is first time we've seen smudge pots lit in the vineyard parcels behind our house. Burning smudge pots just outside our back gate at around 6:45 this morning. I got up at 06h30 and thought I should go out there with the camera. So I pulled on my jeans and Callie and I ventured out to see what we could see. The pots were arrayed in the lowest part of the vineyard. I assume that's where the coldest air would settle. There was no one around; I figured the grower was off to another parcel to light pots there. The vines are leafing out now and there are flower buds, so I hope the pots helped to prevent any frost damage. Smudge pots in the lower end of the parcel that sits to the north of our house, looking east toward the sunrise. So I snapped a few photos in the early light. Callie was excited to be out so early; she'll get her regular walk at the normal time. There was no wind, as you can see from the rising smoke, and it didn't feel all that cold. The thermometer at the house, which normally reads warmer than it would out in the vineyard, read 2.3ºC (about 36ºF), and inside the greenhouse it was a balmy 9.1ºC (about 48ºF). Smoke rising from the burning pots. Out in the vineyard, among the grape vines, we see a lot of asparagus. It's not wild asparagus -- I'm pretty sure it's the standard asparagus we find in the markets. But it has escaped from the fields where it is normally grown. It only grows successfully in line with the grape trunks and not in between the rows of vines. That's because the growers constantly mow, plow, or spray herbicides in the rows and not much has a chance to survive there. 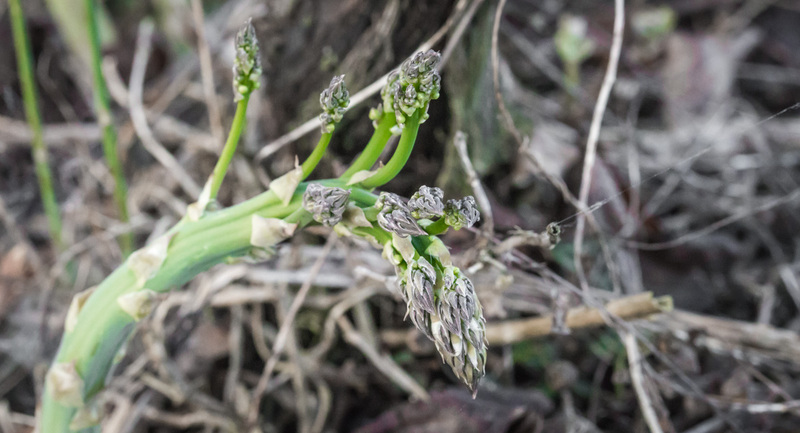 A single stalk of asparagus in the vineyard, already starting to go to seed. The asparagus is green because it grows up into the sunlight. Our local farm-cultivated spears are kept buried so they stay white. In the past there has been so much rogue asparagus in the vineyard that I've been able to pick enough for a meal during my walks with the dog. I haven't done that in a long time now. 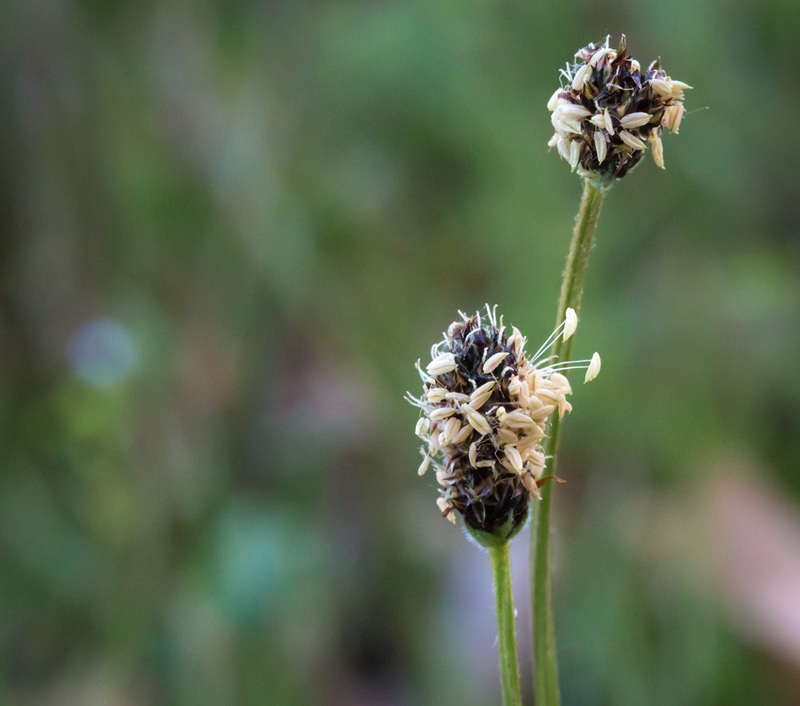 It goes to seed very quickly and if you don't find it early, you've missed it. The irises in our yard are blooming. They are all irises that were here when we bought the house. Some have been dug up, divided, and relocated. Well, sort of. We find that after digging up irises, we tend to pile them up somewhere and forget about them. Then they just adapt and, voilà, we have a new iris patch. 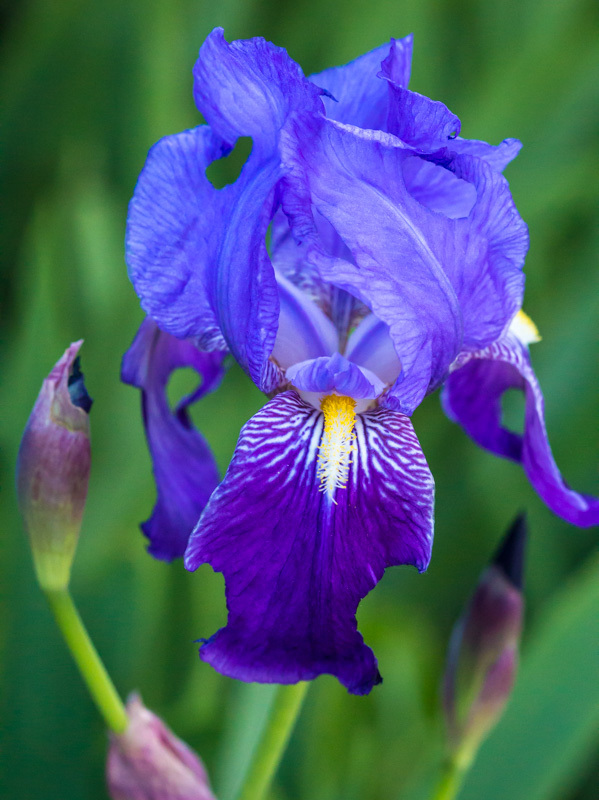 All the irises in our yard are this blue color because they came from the same original bed all those years ago. The long Easter weekend is over and the neighbors who spent a week or so in their vacation houses have packed up and gone home. We'll see fewer people walking and biking through the vineyard, and the vine work will resume. Right now the workers are fastening canes to guide wires and replacing worn out posts. And the leaves are growing fast. They may not look like much yet, but I'm always excited when the seeds I plant actually sprout. Not all of them do, of course, but that's why I plant more than I need. At some point, these will be thinned or transplanted so that there is only one in each pot. They won't go into the ground until after mid-May. Most of these are tomatoes, some of the chili peppers are visible on the upper right. 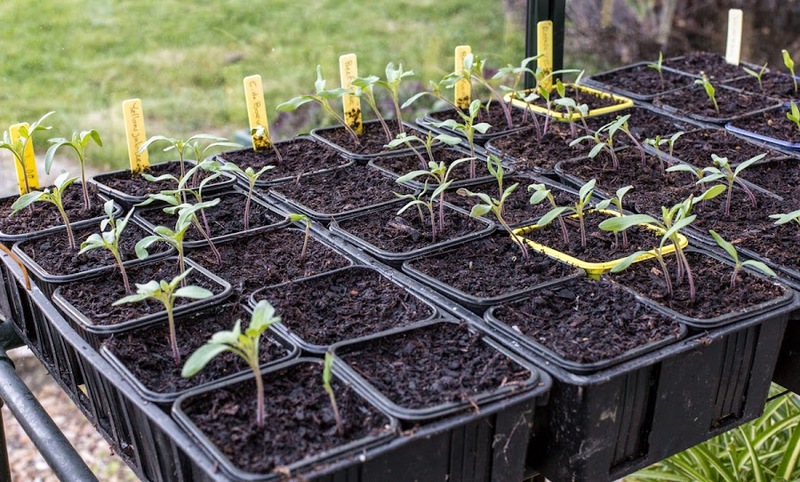 I planted six varieties of tomato. The romas are taking the longest to sprout, but they're starting to show up now. There are four varieties of chili peppers and all of them have sprouted. I have four zucchinis so far (but I'll only save three for the garden) and the eggplant seeds are just starting to sprout. Soon I'll plant annual herb seeds: basil, coriander (cilantro), and chervil. We're already harvesting chives, parsley, and tarragon. If moss can be impressive, I think this bunch is. Maybe it's just the contrast of the moss's green against the brown of the dead leaves. 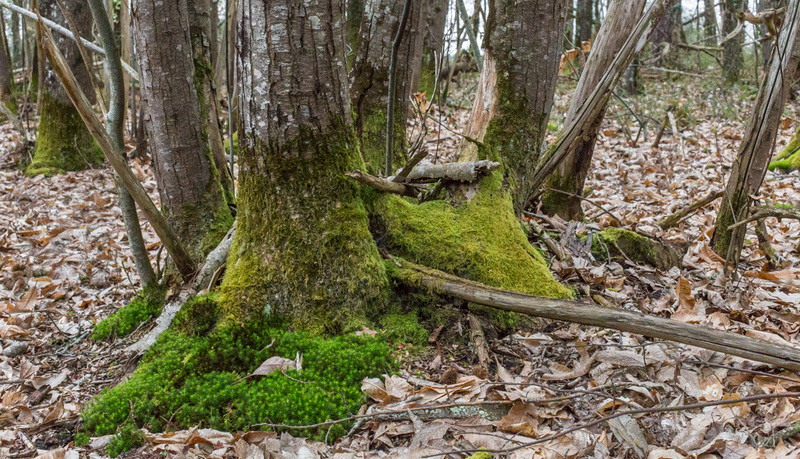 Moss in the springtime woods. I got the grass cut again on Friday and it helps to make the yard look neat and tidy. I'm still working on pruning and cleaning up from winter, but it's getting done. We've started taking plants out of the greenhouse. I brought the geraniums up to the deck along with pots of chives, parsley, and tarragon. It's easier to snip herbs from the deck than to go down into the greenhouse to get them. And the vegetable seedlings are coming along, although they will be in the greenhouse for at least another month. The owner of the winery that I visited a couple of weeks ago collects vintage trucks. I don't know how many he has, or even if they're all his, but several of them are parked around the winery property, and at least a few of them are in working order, like this one. I wonder if those barrels are decorative or actually filled with wine? There's another that's a old van emblazoned with the winery's name. I've seen it at the winery and on the road around town a time or two. The tasting event I went to was held in the building on the right in the photo below. Across the street, on the left, are the caves where that big group of cyclists was taken. If you look very closely, you might see the row of tables on the sidewalk outside the cave, just behind the aqua-colored Renault. Down the middle of each table is a line of empty wine glasses. I don't know if the glasses were for the cyclists or if that was the set-up for the day's lunch event. I didn't stick around to find out. The ends of old wine casks adorn the wall outside the winery caves. 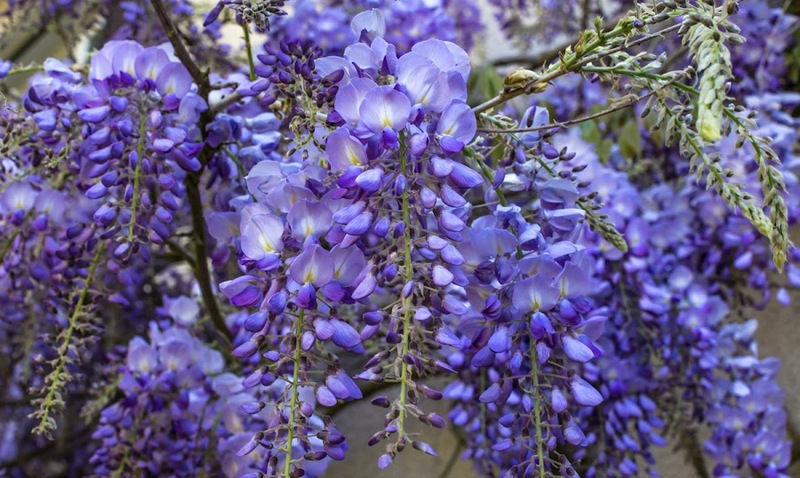 It's called glycine [glee-SEEN] in French. I planted this one on the western wall of the house back in 2006. Now, eleven years later, it's in need of a good pruning. I plan to do that this year once the flowers stop blooming. There are too many crossed and/or straggling branches, and it's getting a little too heavy for its support wire (and that's something I may have to reinforce). The wisteria blooms are still opening up. I've already cut all the runners at ground level, something I have to do once or twice a year. 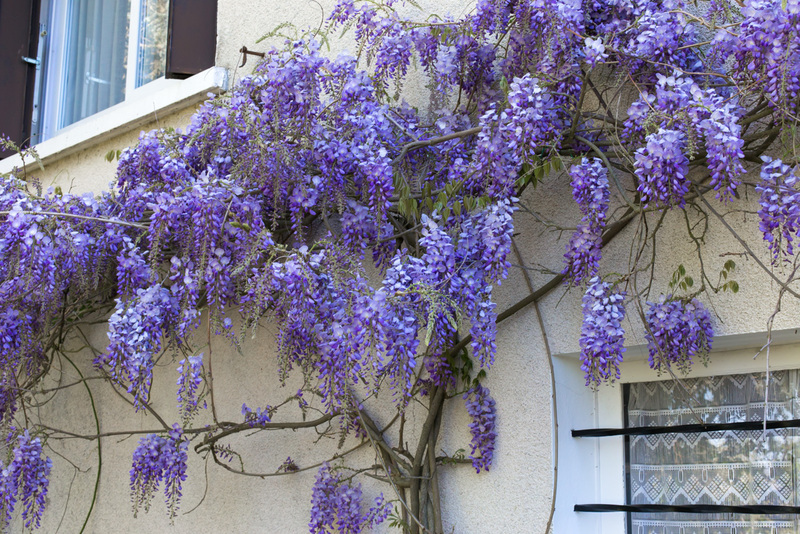 Wisteria will take over and can do damage to walls, so it's best to keep on top of it. This one is still a young plant and its stems are not all that thick. I wonder what it will look like in another eleven years? You can see that the branches need some pruning. Here's a link to a photo I took of the plant in 2010, when it was four years old and just starting to climb. I wasn't able to find a photo from the year I planted it. Still, what a difference seven years makes! This year is a flowering year for our biennial lilac bush and it's pretty much at its peak right now. In the off years, there might be a few flowers, but in the flowering years the bush is covered with purple blooms. I bought the bush from a garden center many years ago without realizing it was a biennial bloomer. I also didn't realize how deep purple the flowers would be. Most of the lilacs around us are either white or a more pale purple than this one. Close-ups work better than long shots for this lilac bush. The lilac is hard to photograph, especially when it's bright and sunny outside. 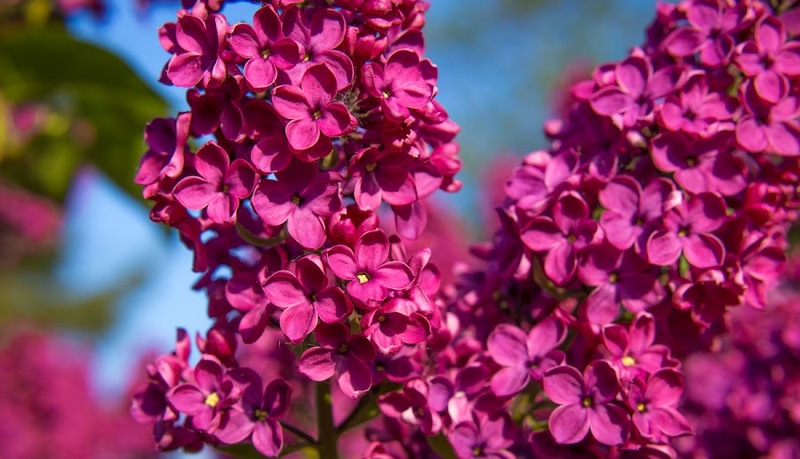 Photos of the flowers come out very contrasted and the purple color is so intense that it doesn't look right in pictures. I've adjusted this shot a little to make it look closer to reality. 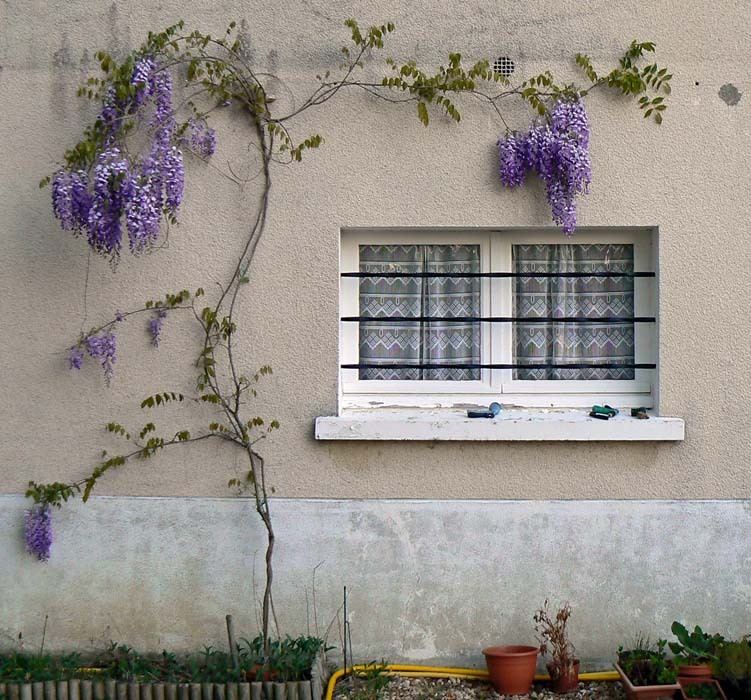 The wisteria is also in bloom, but I haven't got a good photo of it yet. Our temperatures have become more "seasonal," meaning that the warm spell has ended. The mornings are chilly and the afternoons, while pleasant, feel more like April than June (as you'd expect). There's still a lot to do outdoors and it's slowly getting done. On Tuesday I pulled out a lot of saxifrage from an overgrown bed next to one of the garden paths. A spring day out among the vines. Seedlings are sprouting in the greenhouse. The chilly mornings mean it's cooler in there than is probably good for sprouting, but the warm afternoons help things along. So far there are lots of little tomato sprouts, except for the roma tomatoes. Those seeds are old, so they may not come up at all. The first zucchini has sprouted, too. When it gets a little warmer, I'll start planting herb seeds like basil and coriander. Her full name is Natasha, but I'm going to call her Tasha for short. We had to select an official name that started with the letter "N" due to France's rules for dog registry; she was born in 2017 which is an "N" year. The breeder sent us this photo yesterday. We bring her home two weeks from today. Tasha is about seven weeks old now. Are we ready? I'm not sure. I need to get some puppy chow the next time I go to the store. I have a collar and a harness, but don't yet have a bed for her. We'll have to see how the sleeping arrangements work themselves out. I don't know if the two dogs will want to sleep together or separately. Callie has two primary sleeping spots in the house, depending on whether it's warm or cool or other factors only she knows. It will be interesting! And bright copper kettles. Or something like that. I don't know what these wildflowers are called, but they grow on the roadside next to a drainage ditch. They must like damp soil. 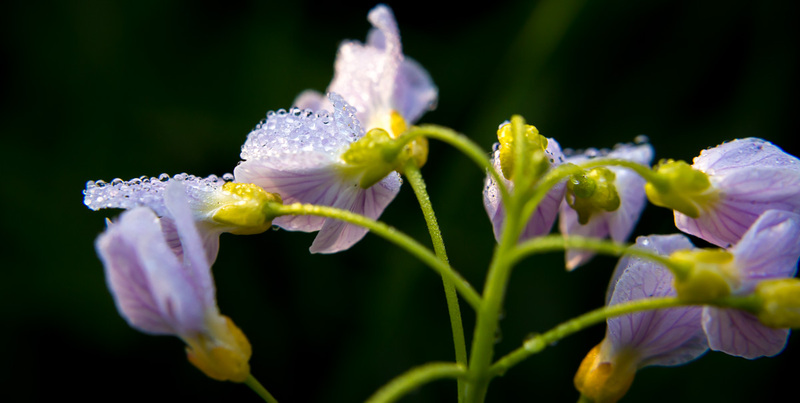 On this particular morning, dew had collected on the petals. They almost look like little eggs, but I know they're not. These flowers are quite small. I used one of the magnifying filters for this shot. Sunday was a nice warm day. I got a little outdoor work done, but nothing strenuous. Next up are two more flower beds that need to be cleaned up, and the grass will need cutting again later in the week. Our daffodils and hyacinths are done blooming. The forsythia is long done and is now green with leaves. More and more of the big trees are getting their leaves now. Lots of green everywhere! 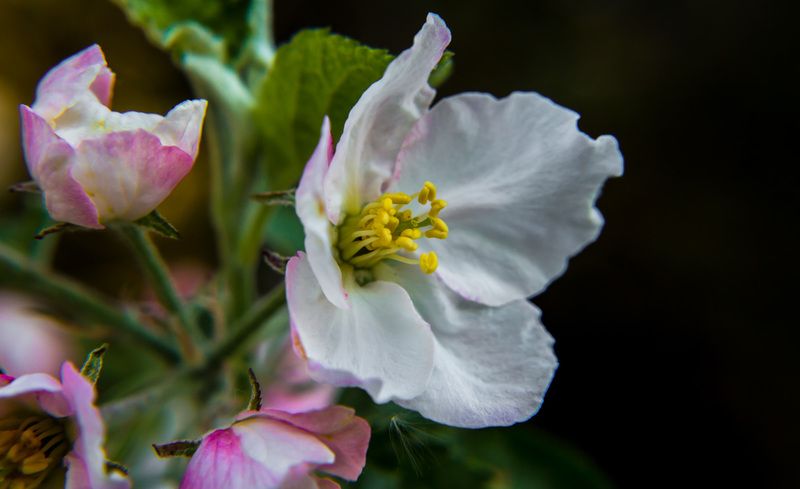 Our neighborhood's apple trees are starting to blossom now, including the ones in our yard. It's too early for me to tell if there will be a lot of fruit on our trees. The pattern has been that the trees are extremely productive every other year. Since I had two of the trees pruned back, the pattern has been interrupted. But that was two years ago and I'm thinking that those trees may have recovered. We will see. As planned, I power-washed the deck on Saturday. It went smoothly and was easier than I expected. I always think big chores are going to be a pain in the neck and, therefore, I procrastinate. But once I get them done I wonder why I was worried. I've found it's just a matter of overcoming inertia. Most of the big chores aren't as big as I think, and I'm so happy when they're done. After the deck dried, I got the table and chairs set up. I even got to sit out there with Bert for a while in the late afternoon. We're expecting a very nice weekend, with sunny skies and high temperatures between twenty and twenty-five celsius. And we've been gearing up to take advantage. I got all the grass cut during the week, but there's edge trimming to do. Ken got the garden plot tilled up, but there is some potting to do and seeds to plant. I will be power-washing the deck today to get it ready for the year. Spring cleaning is in full swing. 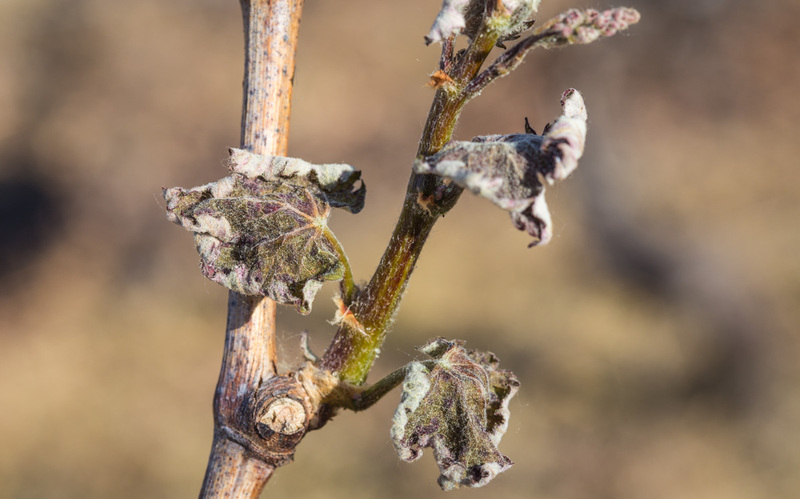 The buds on the grape vines are fattening and leaves are starting to appear in some parcels. 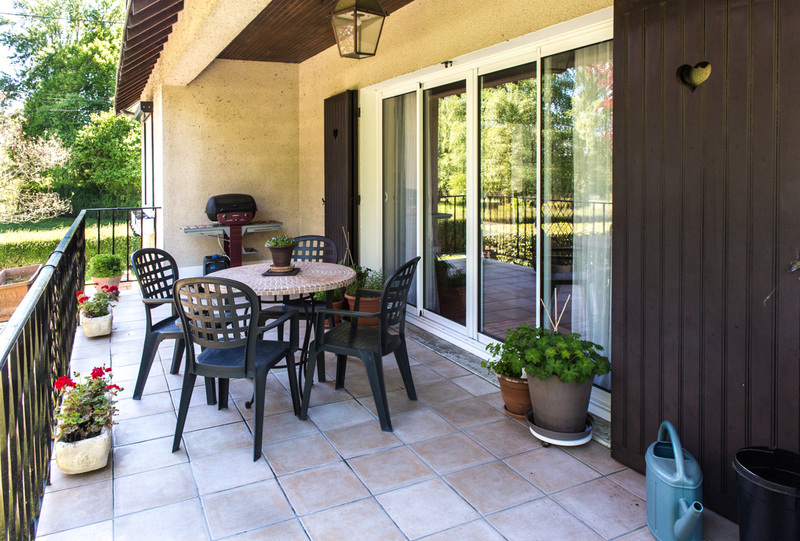 There are always a hundred things to do around the house, indoors and out, especially when the weather is good. Then there are haircuts, dentist, doctor, vet, and groomer visits, and other out-and-about errands to run. And we're trying to coordinate all of that with the new puppy's arrival in just over two weeks. Yikes! I think I've photographed these trees before, but from a different angle (I did, look here). They're located not far off our normal walking route, in a patch of woods that has recently been logged. The cut wood is neatly stacked and covered nearby. I assume it will become firewood. The curvy trees are conifers and therefore not suitable for firewood. These trees are bent toward the southwest, opposite of the normal prevailing wind direction around here. 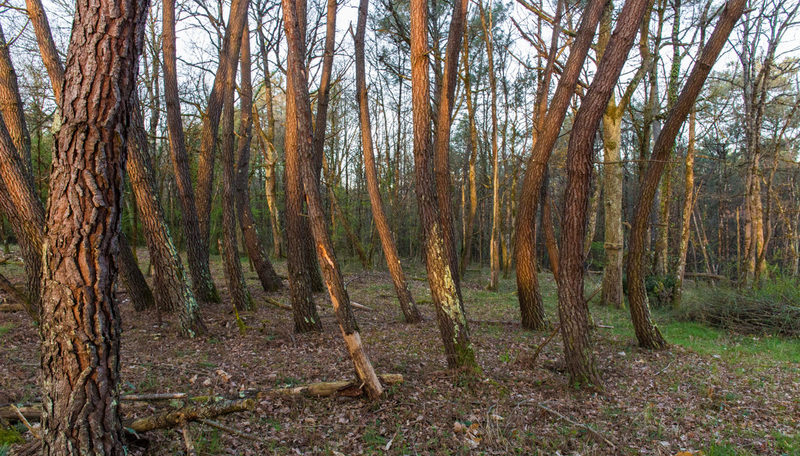 It's hard to imagine what caused the curve in these trunks. It may have been a wind storm some time in years past that bent the young trees without toppling them, after which they continued to grow normally. The bending seems to have only happened in this one section of woods. When I arrived at the winery I visited last weekend, a huge group of people was coming down out of the vineyard and making its way to the wine caves. The people filled up the street and I had to stop for a few minutes as they passed. I noticed that most of them were wearing cycling gear, those lycra-spandex shorts and shirts emblazoned with all manner of corporate logos. Out in front of the caves, several long tables were set up with a whole lot of empty glasses, waiting for wine. Bikes stacked three and four deep against the winery wall. 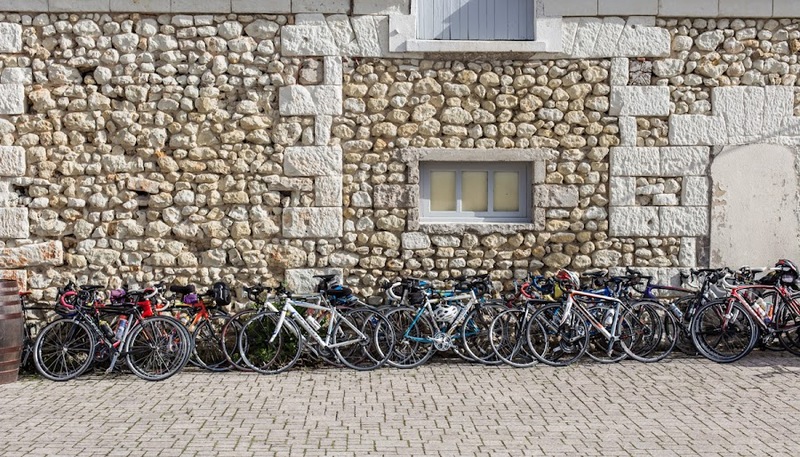 After I was able to pull into the parking area, I saw the bicycles stacked more or less neatly along the wall of one of the winery buildings. Must have been a group tour and private tasting. Then I thought about all those tipsy people getting back on their bikes after their tasting. Oh my. This week we've eaten onion soup twice. Ken made enough for two lunches. It all started last week with some jarret de bœuf (beef shanks) stewed with carrots and onions. That lasted two meals. With the leftover broth, Ken made a base for onion soup, which is traditionally made with beef stock. He sauteed the onions slowly with some herbs and a bay leaf, then further cooked them in the beef broth. At serving time, the soup went into oven-proof bowls and some lightly toasted bread went on top. That, in turn, got topped with grated cheese, and then it went into the oven to melt the cheese. We found these bowls that are perfect for onion soup. We had enough soup left over from the first time for a second meal on Tuesday. We followed it up with a green salad. The second time was just as delicious as the first time. 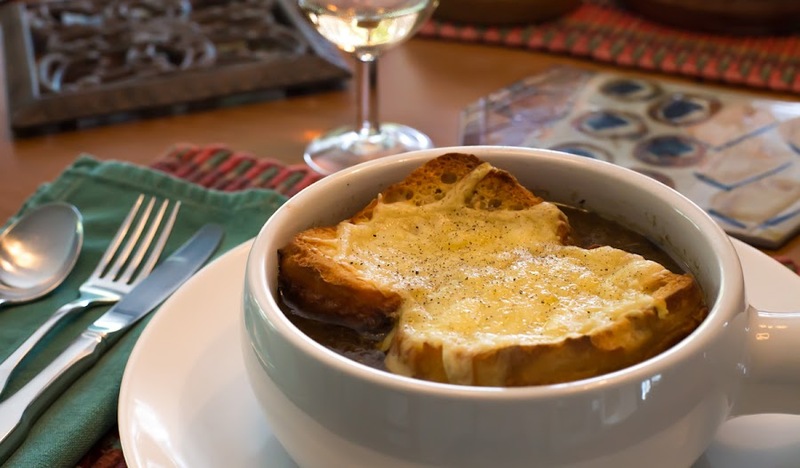 I never tire of the classics, and French onion soup is one of them. I was inspired by a fellow blogger's recent post about tacos to make some on Monday. Our local supermarkets started carrying corn (and wheat) tortillas a few years ago, something that we rarely saw when we first moved to France. We find them in the foreign foods aisle alongside Asian, Portuguese, and British items. We enjoy making burritos, enchiladas, and tacos from time to time. 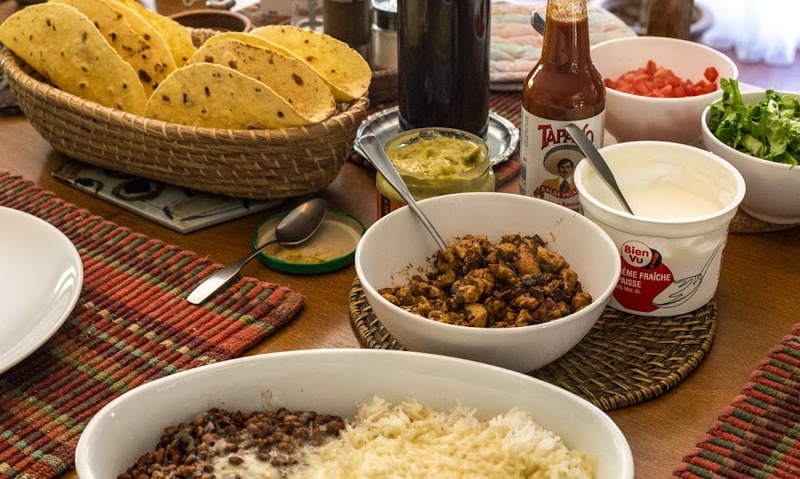 Build-your-own tacos at the table. A tex-mex treat! For our tacos on Monday, Ken diced up some chicken breast and marinated it in a spicy dry rub. After it was sauteed, he added some chopped chipotle chilies in adobo sauce (brought back from the US) for an extra kick. I shaped the taco shells by draping the soft tortillas over the rack of the oven. They crisp up after a few minutes in a slow oven and hold their shape pretty well. We had some guacamole from a jar (not very good, but the fresh avocados in the store didn't look good and they were too expensive), chopped tomato, lettuce, and crème fraîche (a good substitute for sour cream). And, of course, some Mexican hot sauce. We made a plate of beans (field peas from North Carolina) and rice topped with cheese to go along side. Delicious! I've started moving compost from our pile out back into the garden plot. It's almost done, with one or two more wheelbarrow loads to go. I also got a bed of last year's jerusalem artichokes cleaned up and prepped for spring. Ken worked on potted plants all morning, and on making lunch. I'm going to have to cut the grass again later this week. It's growing like crazy! The winery I went to on Saturday is two towns away from ours, down river about ten kilometers (about six miles). It's on the same side of the Cher River that we are in a town called Angé. This is a view looking north from a vineyard above the wine caves. You can see the church steeple rising up from the village center. On the left is, I think, an air vent from the caves below. 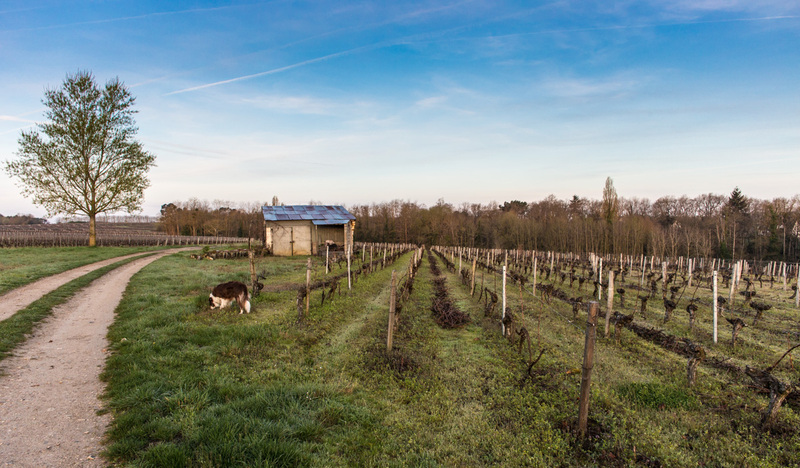 The winery makes organic wines, so there are no herbicides used in its vineyards. Mowing and plowing (with a horse-drawn plow!) help to control the weeds. On the heights above Angé in the Cher Valley. My first row of snow peas has sprouted, so I decided to plant a second row. On Sunday I dug up the dirt and removed a lot of weeds. Then I attached a netting support to the posts I pounded into the ground last month. Finally, I planted about twenty seeds and watered them in. I plan to plant a third row when this second one sprouts. That should ensure us a good crop of snow peas later this spring and into early summer. On Saturday I drove over to one of our local wineries. Every year at this time, this particular winery holds its open house. But it's more than that. 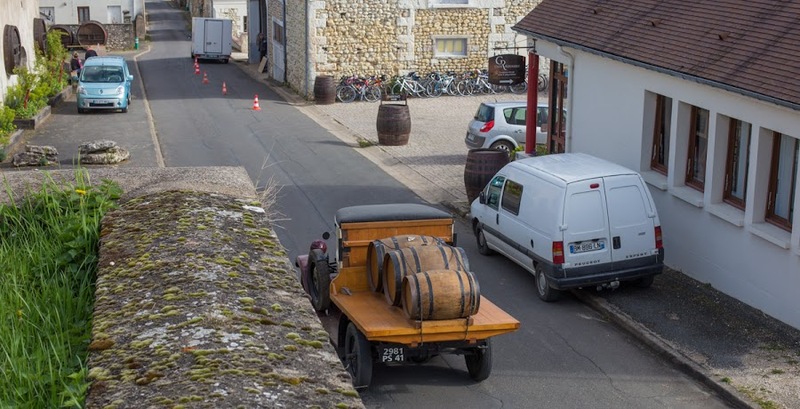 The winemaker participates in a regional exchange, meaning that winemakers from other regions in France come to taste (and sell) their wines here. And he goes to their regions in other times of the year for the same purpose. 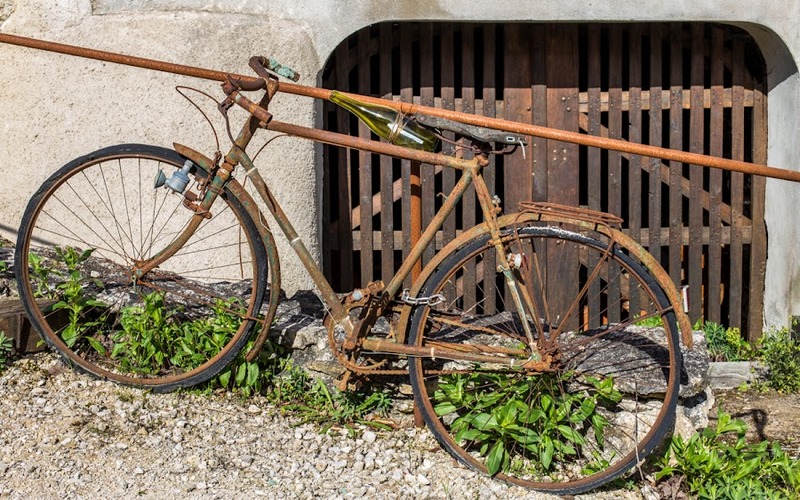 The rusty bike, the wine bottle, and the painted arrow all point the way up into the vineyard. I discovered this event several years ago when some friends invited me to go. While there, I tasted some wine from Chablis, in Burgundy, and I really liked it. Chablis is made from chardonnay, a grape that's not very common around here. In what's becoming an annual thing, I go buy some of that Chablis at our local winery's open house every spring. 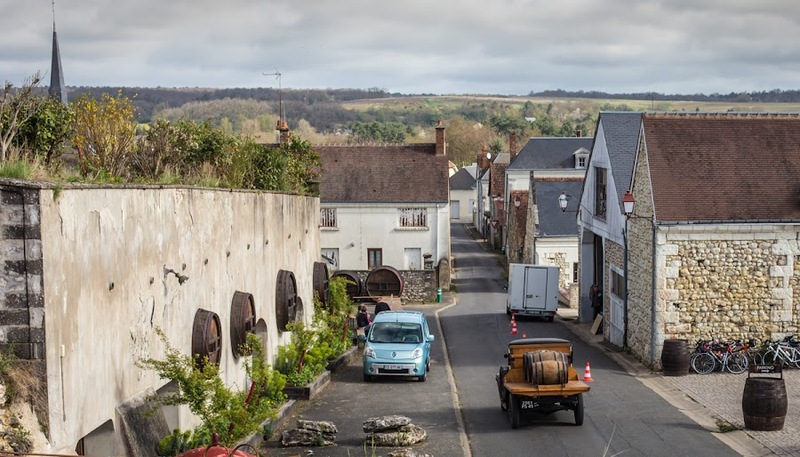 Ken and I went to Chablis in 2014 and visited that particular winery, just because. So now I buy some of their wine when they come here each year. A new tradition. Now that the vine pruning is mostly done, the growers are out grinding the cut canes into mulch. You can see the canes lined up in every other row, ready for grinding. And we can hear the grinder out there. It's not really all that loud, and it doesn't bother anybody. You just know it's there. Here's Callie munching on some grass. I don't have a photo of the grinding. Our boiler got a clean bill of health on Friday. It should; it's not even two years old yet. And it's still under the manufacturer's guarantee until October. We have a service contract with the company that installed it for regular maintenance and emergency service. They're pretty good -- we had the same service contract for the old boiler. Once a year, the technician cleans the innards, makes sure the parts are working properly, and does the kind of technical maintenance that I can't, so it's a good investment.